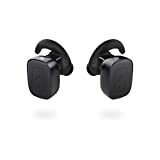 With a retail price of just $39.99, you’re not going to get quite the same audio quality out of the SmartOmi Q5 True Wireless Bluetooth Headphones that you get from Apple’s $159 AirPods. Well, actually, maybe you are. AirPods have shockingly good audio, but the smooth plastic tips don’t isolate sound in your ears so they never really live up to their potential. Meanwhile, the silicone tips on SmartOmi’s Q5 cord-free earbuds stay as snug as a bug in a rug when they’re in your ears. If you want to check them out for yourself before you dump all that cash on AirPods, now is the time to do it. Why? Because they’re on sale right now on Amazon at a new all-time low price. Use the coupon code 53JVWCQJ at checkout and you’ll pay just $18.79!